Is the MBP good enough to edit 4k video? Discussion in 'MacBook Pro' started by EdisEdward, Jan 13, 2017.
i got a new camera and want to start making some videos for fun in 4K. My 2011 MBP just won't do it. Which MBP is good for 4K editing? Which year, which model is recomended? Any new Mac will edit 4K video just fine. If you want it to be fast rendering etc then the quad core in the 15 inch or an iMac is a bonus but as it's for fun you should be fine with any of apples current offerings. Well a desktop will almost always get you better specs for the money, but if you need or value portability then obviously a laptop is better value. An iMac would be a far better value purchase, yes - but only if you don't need it to be portable, obviously. You said you have your iPad and work laptop for that, though. The 5K iMac build benchmarks about 30-40% higher than the MBP, for the same price. You can also edit 4K footage natively on the iMac, and it still won't take up the full screen. Video editing/rendering is one of very few tasks where benchmark numbers actually provide at least some relevance to real-world performance differences. The obvious downside of the iMac is that it's not portable. In short, the 5K iMac offers better performance and value, but is only relevant if you don't need portability. It's also likely to be updated in the not-too-distant future, but that's pretty much always the case with tech. Edit: One thing to flag - if you're writing/rendering/working with video files that are tens of gigabytes in file size, then you might suffer from an I/O bottleneck with the slow spinning HDD in the iMacs. Someone with more video editing knowledge might be able to advise on this. The problem with Fusion Drives is that they're terrible for people who work with large files - in these cases they are bottlenecked to a speed achievable in the late 90s because of the old spinning drive they use. This graph perfectly illustrates this: http://images.techhive.com/images/article/2012/11/fusionstress_filestoexternal-100015134-orig.png. 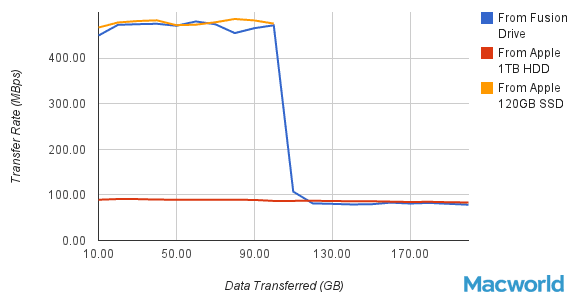 See that huge drop at the ~100GB mark. That number will vary depending on how your Fusion Drive decides to organise itself (based on your Mac usage). The problem with Fusion Drives is that they're terrible for people who work with large files - in these cases they are bottlenecked to a speed achievable in the late 90s because of the old spinning drive they use. This graph perfectly illustrates this: http://images.techhive.com/images/article/2012/11/fusionstress_filestoexternal-100015134-orig.png. I agree about the I/O bottleneck. Even an 18GB video file on my 2010 Mac Pro with a pretty speedy HDD (Gets around 200 MB/s, pretty good for a HDD) is a bottleneck. I got a 1TB SSD for these tasks (which definitely DOES max out SATA2) and it is MUCH better. Depends on what program you use, if it's Final Cut great, if it's something else then no, performance will be horrendous..